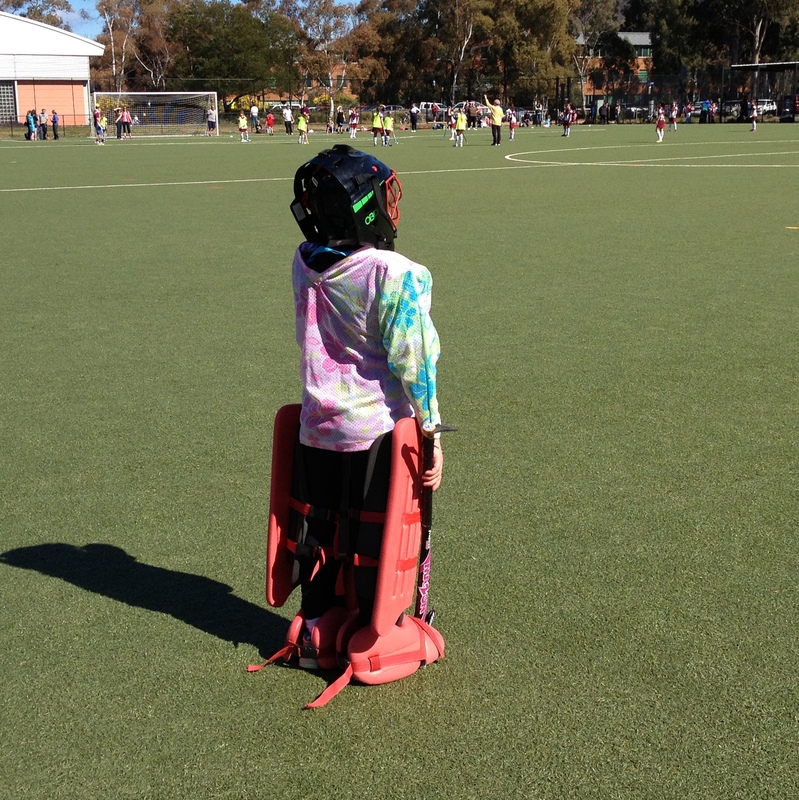 The two girls played hockey yesterday and it was a joy to stand next to the worlds smallest goalie and to be in the sun without a jacket on. 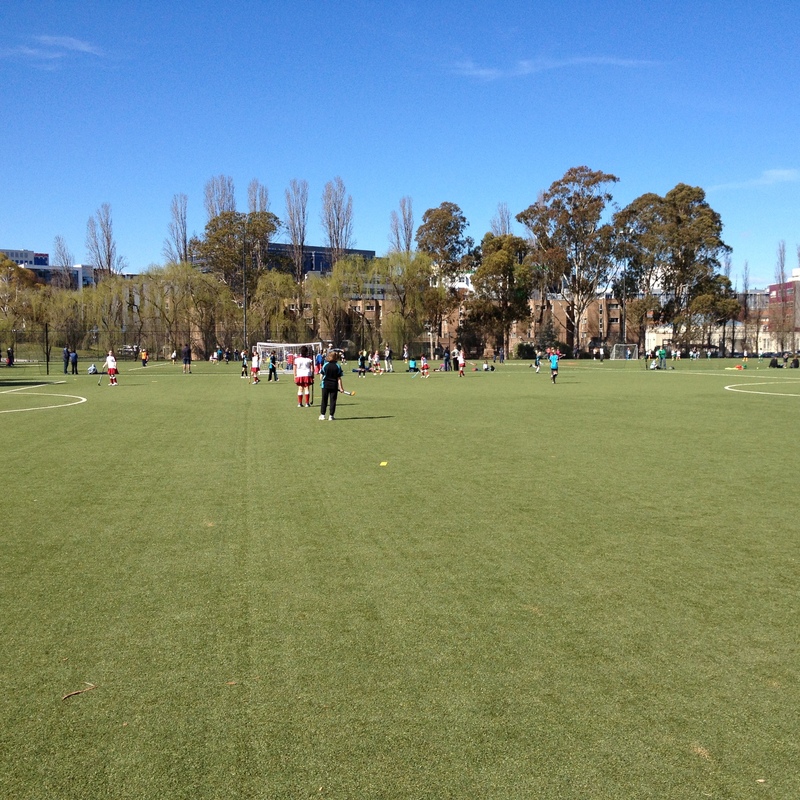 They did well, with the middle chick/goalie saving two goals and the team winning 5-0. In a scene that had everyone smiling she ran out to save a goal, gave an almighty kick that did the job, and landed on her backside. She immediately sat up saying “I’m okay” in a very chirpy voice, the coach ran onto the field and picked her up so she was upright again and the game continued. It was verbally replayed several times over the course of the day, with much mirth. Her big sister did a great job in defending and was also full of mirth about the world’s smallest goalie and her ‘I’m okay’. The boy was incredibly focussed on the whole game and provided non-stop cheering and encouragement for the whole game. We had a great morning together! The rest of the weekend has been busy with children’s social activities. The middle chick had a party to attend for her best-boy friend on Saturday. That, of course, required a gift. I, of course, had not been shopping. She assured me that he didn’t like drawing enough to warrant a pencil roll. 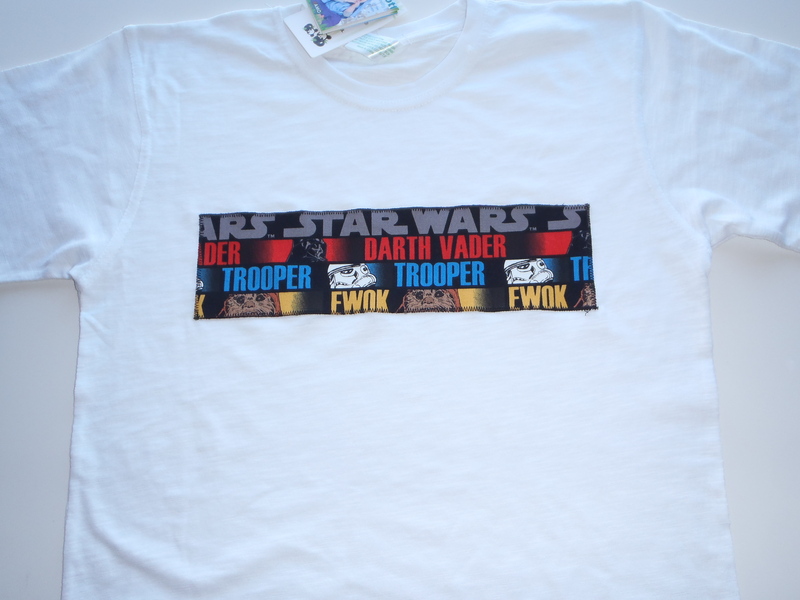 Hmmmmm…… then it hit me – a t-shirt with Star Wars fabric. She approved the concept and was happy with the end result, and a crisis (due to a very tight timeframe) was averted! While she was at her party the eldest chick had a friend over to play. The visit had been conditional upon both girls cleaning their bedrooms and completing their homework before the appointed time. I am slightly astounded to report that the eldest chick did an amazing job on her room – including vacuuming the carpet. Unfortunately the homework didn’t fare so well as she had ‘forgotten’ to bring it home. Hmmmmm….. On balance, however, the play seemed justified in both households. The two girls decided that they needed to bake. They are both gluten free so were excited to have a cooking buddy. As they pored over books and questioned me about my available ingredients I finally suggested salted caramel fudge (because I had all the ingredients ready from the aborted attempt the week before and knew it would stop the deliberations!) They did a great job, and with a friend visiting, the clean up actually occurred without prompting. Wonders will never cease! They then decided that, having made the fudge, they should sell it to raise money for breast cancer, which is a cause very dear to the friend as she watches a much loved aunt undergo treatment. After initially supporting them in their concept, a bit of judicious questioning revealed that the audience for the sales was limited to…..me. I pointed out that as I had provided all the ingredients it was a little cheeky to ask me to buy the fudge back. This left the friend a little deflated. But all is not lost! I have since suggested that she host a Pink Ribbon fundraiser morning tea, and that fudge can be part of the menu, and she is now busy planning a fundraising event that will give her a lovely positive focus and a way to help. Ah the complexities of being young women full of ideas. I admire their spirit and optimism and want to bottle it and preserve it for them before they get worn down by life! I saw this sign on Pinterest today and it made me think that I need this reminder so that I can have that same daily optimism again! Today was another day of socialising. The boy had a visit to the little sister of the eldest chick’s friend and the two of them had a ball playing with puppies, with lego and in a big cardboard box. Then he came home to have another friend waiting for him and the two of them played a bit of Wii, a lot of imaginary games involving spies and sorcerers in the back garden, and then (unbeknownst to me) a bit of re-decorating the eldest chick’s bedroom with marker pen. Another hmmmmmmm……. Luckily it was waterbased! The middle chick had her best-weekend-friend (they play together a bit at school but on weekends are usually each other’s first choice of friend to play with) over for the day and they explored the mountain reserve across the road, coming home with animal bones, stones, dirt and a beer bottle. They said that they are examining the environment to see if it is being damaged. They seemed to be drawing a link between the beer bottle and the animal bones. Hmmmmmm….. not a lot of logic but a good conversation to be starting! The eldest chick had the afternoon at another friend’s house and was apparently soundly beaten playing Yahtzee her friend’s father. There was a bit of fake fist-waving at him in the retelling of the story so I think a good time was had by all. 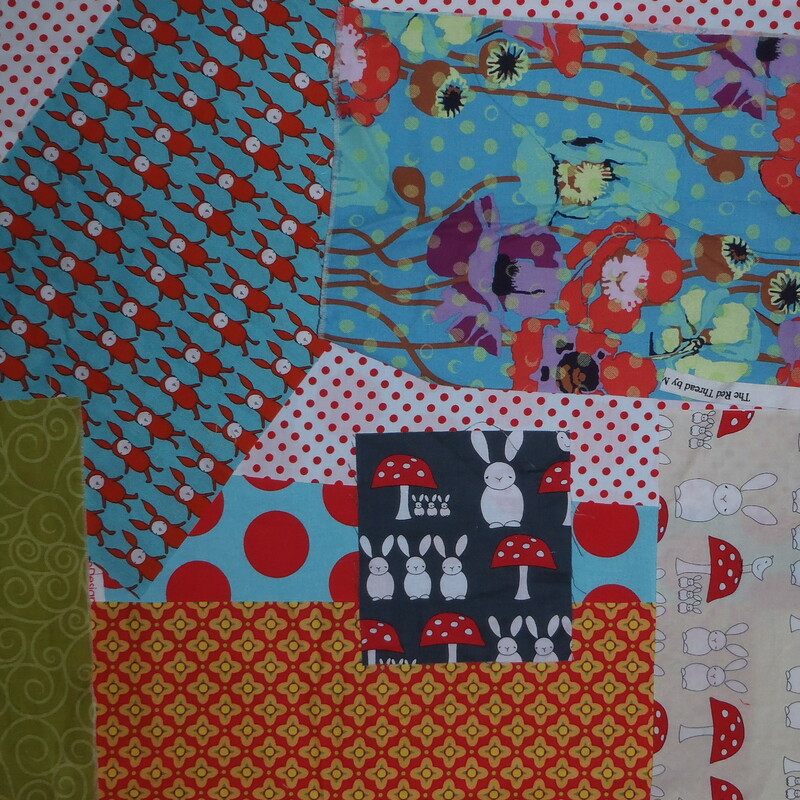 The week ahead does not hold much prospect of sewing. The eldest chick has the finals of Wakakirri tomorrow night, and then I am away for a work trip overnight in the middle of the week for two full days. Which, with other sporting commitments, takes me through to Friday before I am likely to be free to do anything…. Hmmmmm…..Rather than being upset about it I am thinking that this will be time to think and plan and dream. Then I can return and ‘do’. Hopefully! I hope that this week sees a hint of spring (or a touch of fall if you are on the other side of the world) and time to do the things that are important to you. This entry was posted in Sewing, Uncategorized and tagged applique t shirts, balance, breast cancer fundraiser, children, fabric, family, hockey, socialising, spring on August 25, 2013 by a little bird made me. Thank you Debra! She is a bit adorable!